Season four of The People’s Couch TV show premieres on Bravo, Friday, January 15 at 10:00pm ET/PT. The fourth season of The People’s Couch consists of twelve new hour-long episodes. On The People’s Couch, real families and friends watch and dish TV together. Among the returning couch potatoes are Amanda Morrison, Kenya Taylor, Blake McIver Ewing, Scott Nevins, Emerson Collins, Julie Goldman, and Brandy Howard. Event coordinator Kenya and nanny Amanda are sisters and roommates with a fifteen-year age difference. The half-sisters did not know about each other earlier in life, so when Kenya found out she had a younger sister in Arkansas, she invited her to move out to Los Angeles. 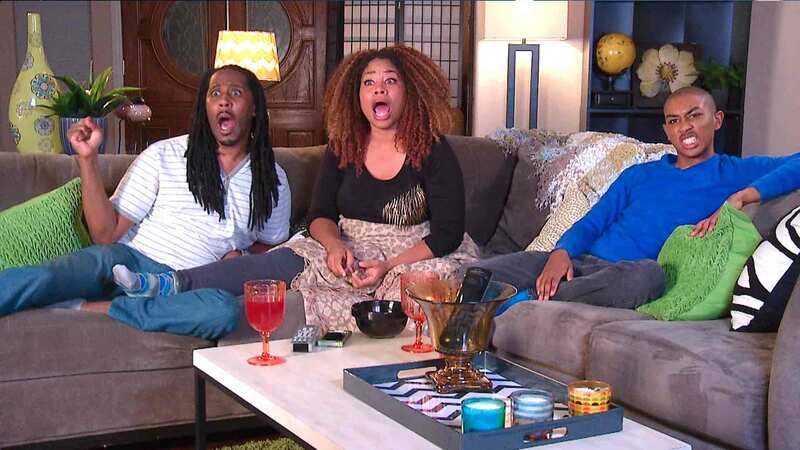 These animated TV aficionados yell at the television and immerse themselves in their shows of choice – or more often older sister Kenya’s choice as she keeps a firm grip on the remote. Though these best friends are all single and not interested in dating each other, Scott says they occasionally fight like an “old, married three-way couple.” TV host and comedian Scott is a self-proclaimed “former fat kid” with a raging sweet tooth who has never had a sip of alcohol, but that doesn’t stop wine connoisseur/singer/songwriter/go-go dancer/child star from “Full House,” Blake, from enjoying a glass during TV viewing. While foodies Blake and Scott enjoy fancy snacks on the couch, film producer Emerson “eats like a five-year-old” and prefers to munch on sweet treats. Persian sisters Destiney and Cathy are inseparable purveyors of pop culture and the good life. When they are not working together in the nightclub that Destiney runs, they curl up on Destiney’s pillow-filled couch with popcorn, fruit and shirini (sweets in Farsi). Cathy is extremely busy between two jobs and caring for her nine-year-old son, while Destiney is the life of the party at one of the hottest clubs in LA. But both always find time to escape to Destiney’s for some sister quality TV-time. Watching television is a family affair for gaming consultant Joe and his three adult daughters Rachel, Sarah and Nicole. These tight-knit sisters love hard and sometimes fight hard, but they all agree that they are daddy’s girls through and through. However having dad on the couch can lead to some awkward sister moments, but Papa Joe realized early on that with no sons he might as well join in on silly girly fun. Teddi, Ayn and Sue are friends living together in a senior artist community, but don’t count out these self-proclaimed “glam-mas.” When Teddi is not traveling the world, the feisty ladies spend a good deal of time together watching their favorite shows, during which they argue and enjoy snacks – which is always accompanied by a sippy cup of Pinot Grigio for Ayn. “The People’s Couch” is produced by Studio Lambert and All3Media America with Executive Producers Stephen Lambert, Greg Lipstone, Greg Goldman, Tania Alexander, Aliyah Silverstein and Jacob Cohen-Holmes. Are you a fan of The People’s Couch TV series? Will you tune in for the fourth season? Tell us. More about: Bravo TV shows: canceled or renewed?, The People's Couch, The People's Couch: canceled or renewed? We live in Alaska and just love love People’s Couch!! After a long winter we cannot wait for return!! Love and respect to all!! Can totally relate! Sincerely Mary, Brooks and crazy dog Prancer, yes Prancer. She is a rescue dog name came with her but does fit her!! Thank you for coming back!! BRING BACK THE PEOPLES COUCH!!!! It always made me laugh! And make me smile at the end of a bad day!! I watch the reruns over and over-but would love to see MORE!!! The people you have on the couch make it what it is-AWESOME!!!!! I LOVE THE PEOPLE’S COUCH ! What a great show. I LOVE THE ZENO FAMILY AND EMERSON, SCOTT AND BLAKE. EVERYONE AS A GROUP MAKES THIS SHOW HAPPEN. IT IS A GREAT WAY TO END.A DAY…SMILING! I am writing this November 11, 2016 why is such a good show taken away and still among the missing when there is so much crap tv left to be on the air? I miss THE PEOPLE’S COUCH ! Bring them back…PLEASE! I love, love, love this show. The tv clips can be funny but the real show is the couch potato. My favorites potatoes are the Zeno Family and Julie and Brandy. The elderly ladies can really be a hoot when they admit to some raunchy activity from years ago. I hope this show goes on and on. There will always will be plenty of shows to laugh at and react to these days.